Information and links to a wide range of on-line services in Australia. Users can search via topics of interest or through the site's guided search function. The Toolbox on ReachOut.com recommends mental health and wellbeing apps endorsed by mental health professionals and young people aged 13-25. Includes links to apps, reviews and information. ​NoStigmas empowers a global mental health community through education, support & action. Created for peers, by peers- It’s mental health our way! On-line 'chat' or email counselling for young people 5-25 years. Also phone available 24/7. Mensline is a 24/7 free professional telephone and on-line counselling service for Australian men. 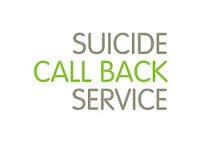 Provides a free nationwide 24/7 professional telephone and on-line counselling for anyone affected by suicide. eheadspace on-line chat, email or phone call with a qualified youth mental health professional for young people 12-25 years and parents and carers worried about a young person. QLife is an on-line chat or phone counselling service for lesbian, gay, bisexual, transgender and intersex (LGBTI) people.